Wire Laundry Carts are rolling laundry carts designed for use in many types of laundries, including a coin laundry, a commercial laundry, a hospital laundry, or an on-premise laundry. 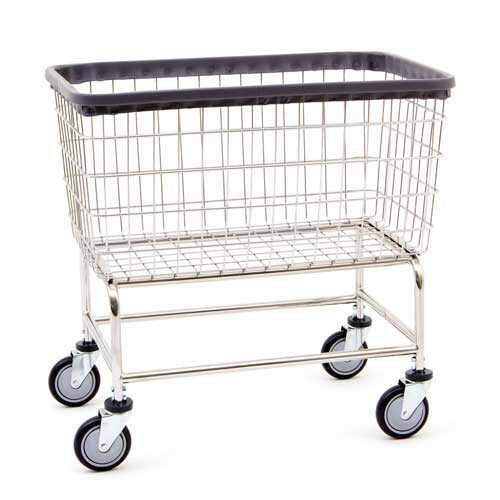 These hospital laundry carts with wheels are manufactured by R&B Wire and are made with 7/8 inch heavy steel tubing for increased durability. These durable laundry carts are warranted by the manufacturer for life against breakage on the welds and frame. The frame is chrome plated for a durable and attractive finish. Four caster wheels of 5-inch diameter come equipped with non-marking polyurethane tires. Soft, non-marking bumpers protect walls and equipment from damage. Select between two separate versions--Standard Laundry Cart and Heavy Duty Large Capacity Laundry Cart. The standard model weighs less than 30 pounds and can carry up to 2.5 bushels of soiled linen. The large capacity model has a larger size to accommodate more soiled laundary and a greater weight capacity. It weighs 34 pounds and can carry a load of 2 additional bushels of laundry more than the standard model. R&B Wire products are manufactured in the USA. Vitality Medical carries several R&B Wire laundry assist products as well as medical patient products, including the Bulk Transport Truck, Economy Hamper Stand, and Hospital Privacy Curtains. 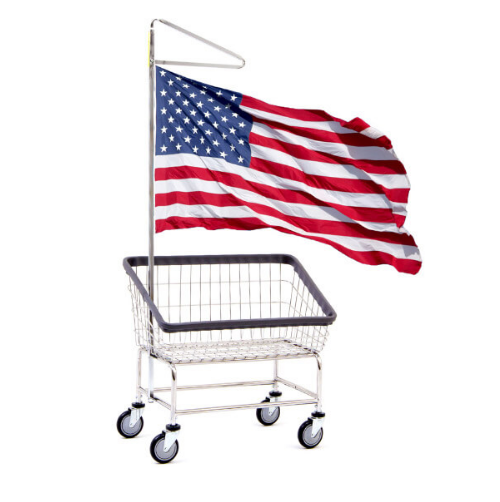 Hospital linen cart that is tough to meet the demands of the toughest laundry. Wire frame laundry carts for home use. 7/8 inch heavy duty steel tubing construction for durable laundry service. Non-marking polyethylene tires keeps your laundry room floor un-marred. Soft, non-marking bumpers protect laundry equipment and walls. Chrome plated frame for an attractive finish. Select between standard or large capacity size laundry carts with wheels. Provide years of trouble free laundry operation. Caster wheels are designed to reduce debris pick up in the hubs. Application: Heavy duty laundry transport.